Seeding is progressing well, with many regions complete or near complete. 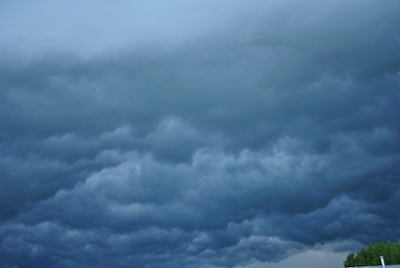 Rain delays in parts of eastern Saskatchewan and western Manitoba have held up seeding progress. Crop insurance deadlines are close for Alberta, although some regions have requested an extension. Contact your local office for the latest. Saskatchewan Crop Insurance Corporation deadlines vary by R.M. Call the SCIC toll free customer service line at 1-888-935-0000 or visit the local SCIC office for specifics. In Manitoba, canola area 2 has a deadline of June 10 for full coverage, and canola area 1 has a deadline of June 15 for full coverage. Warm temperatures and ample moisture mean lots of aggressive weed growth. Take care of weed competition early to limit yield loss. Canola should canopy quickly this year, in which case one in-crop herbicide application is often enough. 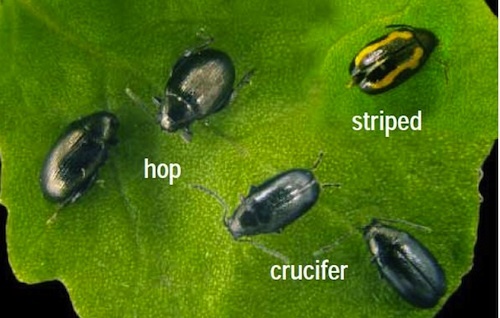 Flea beetles also become more active with warmer weather. 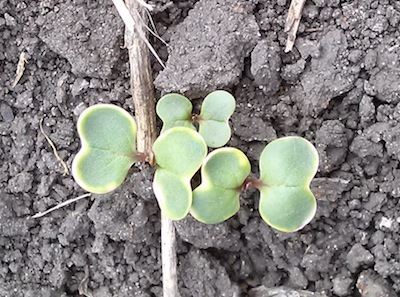 Take a look at fields shortly after emergence, and keep checking regularly until canola reaches the 4-leaf stage. 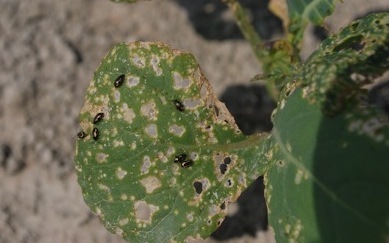 Send a tweet to @CanolaWatch and tell us about your flea beetle situation and anything else you notice while scouting. Use the #canola hashtag. What percentage of this leaf has been eaten? 1. Streambars or dribble bars are long bars — 12” to 15” or so each — with 4 holes along the length. They attach to each sprayer nozzle point, with the bar designed to reduce the distance between streams. 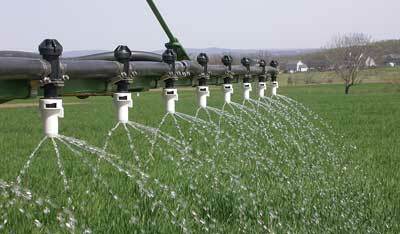 Advantage: Streams drop straight down so spray patterns are unaffected by boom height. Disadvantages: They are more expensive than the second simpler option, and they are more likely to break if the boom hits the ground. 2. Fertilizer nozzle bodies with 3-4 streams fanning out in different directions from a single point. (See the photo at the top.) Advantage: They tend to be cheaper than streambars or dribble bars. Disadvantage: Patterns can overlap more as boom height increases. You may have observed canola with a yellow halo around the outside edge of cotyledons. If this happens when growing conditions are optimal and there hasn’t been frost, seed treatment is the likely cause. When the plant is growing very fast, translocation of seed treatment into the plant is also very fast. This can result in an occasional yellowing of the margins of the cotyledons. It does not affect plant health or efficacy of the product. Applications made when cool cloudy days follow cool nights will result in lower herbicide efficacy than applications made in warm sunny days. Cloudy days don’t provide the photosynthetic activity required for many herbicides, including Group 10 glufosinate. And nights near freezing followed by days with highs that barely reach 10 C will not provide high metabolic activity required for best results from Group 9 glyphosate. Many factors can cause a thin canola stand. Proper diagnosis is important for effective management. Here are common factors, with diagnosis tips for each. Use our new Canola Diagnostic Tool on your smart phone or tablet for help in the field. Watch the video at the top of this article for a tutorial on how to use the tool. The latest entry for the Manitoba site has photos showing the differences in seed depth for 3 mph vs 5 mph (shown) seeding speed. 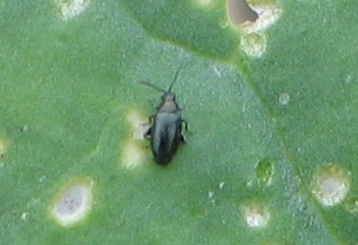 Manitoba has planned a blackleg scouting clinic at the UCC site June 7. Eight sites are seeded in Alberta, and establishment is generally good. In Saskatchewan, the Indian Head site is seeded and we’re waiting on an update for Scott.